The generic name of sea lion covers more than ten species, for example: Fur Seal, California Seal, Sea Lion, Steller Sea Lion, Galapagos Seal, etc. Evolution has endowed sea lions with a long body (A length of about 1 to 3 metres according to the species) fully adapted to marine travel, with a small head, powerful front paws which serve as propellers and independent back paws which serve as rudders in the water, but also allow them to move efficiently on land. Unlike seals, whose back paws are angled to their backs so that they cannot travel on them, which forces them to crawl when they are outside the water. Another major difference from seals is in their ears, as sea lions have small outside ones (The origin of the word ‘Otary (Sea Lion or Eared Seal)' is in fact derived from the Greek ‘Otarion', which means small ears). Their weight and size varies a great deal from one species to another, since the lighter ones weigh several kilos when they are longer than one metre, while the bigger ones weigh about a tonne and can be longer than 3 metres. The difference between the sexes is very notable and with some species, the male can weigh 3 to 5 times more than the female. Sea lions go to the land to reproduce. In order to do this, they must not only attain sexual maturity (Between 3 and 6 years for women, 4 to 5 years for males) but also social maturity where males are concerned; this is in order to be able to defend their territory and that of their females, which according to the species do not generally reproduce before they are 5 to 10/12 years. The reproduction cycle begins with the search for suitable land territory by the dominant males; this is where a harem is established, which can consist of several females amongst colonies which can be composed of thousands of individuals. The gestation period will last almost a year and a female will produce only one little one on her return to land the following year; she will breastfeed it for several months. Sea lions have a longevity which varies from 18 to 30 years according to the species, with females generally living longer than males. 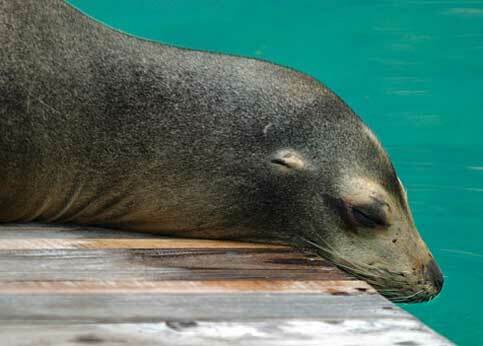 Essentially sea lions are found in the Pacific, but also in the Atlantic. They feed at sea, hunting for fish (herrings, etc. ), cephalopods (Calamari, etc. ), etc Their exceptional physical qualities allow them to dive more than 100 metres and remain underwater for more than 5 minutes. In order to resist the cold in the regions they stay in, certain sea lions have valuable fur which resulted in them being hunted in terrible campaigns, and consequently they became protected species and they are also registered in the table of vulnerable species. Overfishing, which deprives them of their food, pollution as well as driftnets are among the main threats that sea lions face today, not forgetting the fact that thousands of individuals are killed every year by tribes in the Great North and those that are victims of fishermen, whether this is accidental or not. We have all heard talk of the ozone layer. What is it used for? This case file will help you to understand why it is vital for man to preserve it.